This bronze culverin (Fr. couleuvrine, meaning snake like) was made by Andri Brasseux in 1568. It's a type of small cannon which fired solid shot (ie cannonballs), in the days before shot became explosive in its own right. 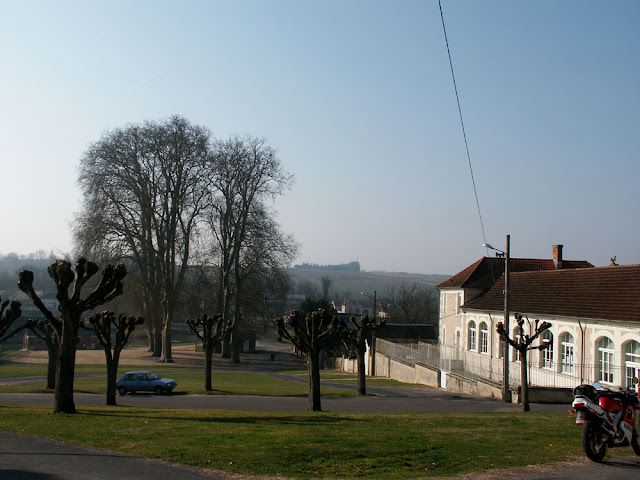 Brasseux may have been a local whitesmith (Fr. potier d'étain) as the culverin is inscribed 'ANDRI BRASSEUX, POTTIER DETEN FETTE SETTE PIESSESY SIMON DUFOUR SOLLICITEUR 1568'. I interpret the inscription as saying 'Andri Brasseux, whitesmith, made this piece, commissioned by Simon Dufour, 1568'. Whitesmiths work with tin and pewter, mostly making domestic vessels and implements. Some of them would have understood the process of making tin alloys such as bronze but normally they worked with metals cold (unlike blacksmiths). Further inscriptions on the cannon indicate it was modified in 1751 and again in 1774. It also shows the arms of Issoudun, the names of the governors and the arms of Charles de Barbançois, Seigneur de Sarzay. Charles Barbançois came to Issoudun in 1562 to lift the seige of the town which was occupied by the Protestants. In recognition of his services the King Charles IX named him lieutenant general and commander of the troops in Berry, then governor of the town and chateau of Issoudun. 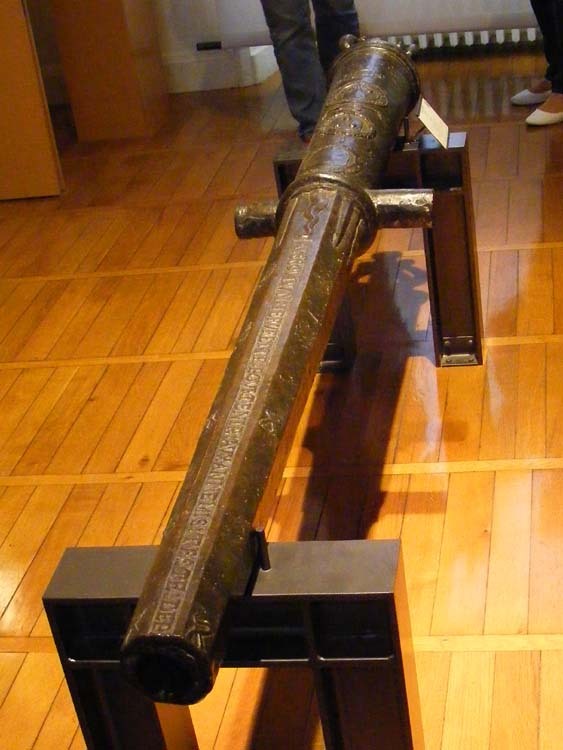 The cannon, with its multiple inscriptions is a veritable history of the Wars of Religion in a single object. It comes from the town ramparts of Issoudun. 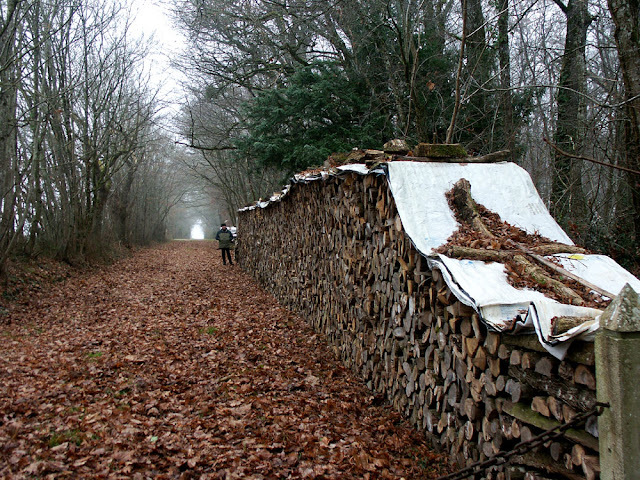 Six million cubic metres of wood are produced in the Centre-Val de Loire region annually. Whilst the market for lumber has stagnated, with prices not having changed for 30 years, the market for wood as a bio-fuel has really taken off in the last few years. Firewood in the Forest of Preuilly. 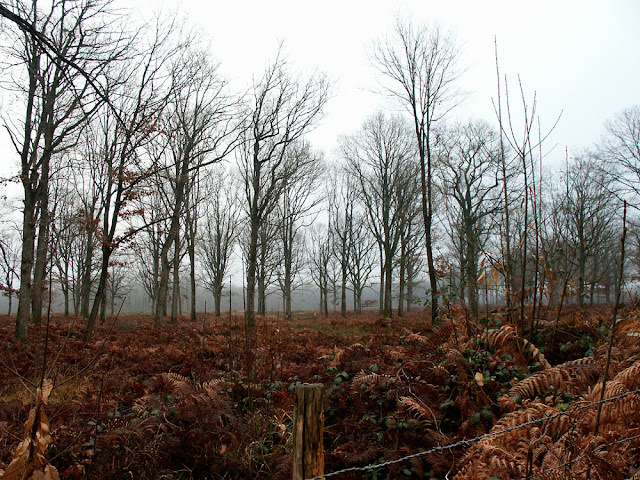 This has led to concerns expressed by the President of the Union of Private Foresters that without a unified management plan the Touraine risks deforestation. He has told his 440 members that if they opportunistically cut their woods for fuel without succession planning, bio-fuel is a mirage. Wood has already been in short supply for several years. 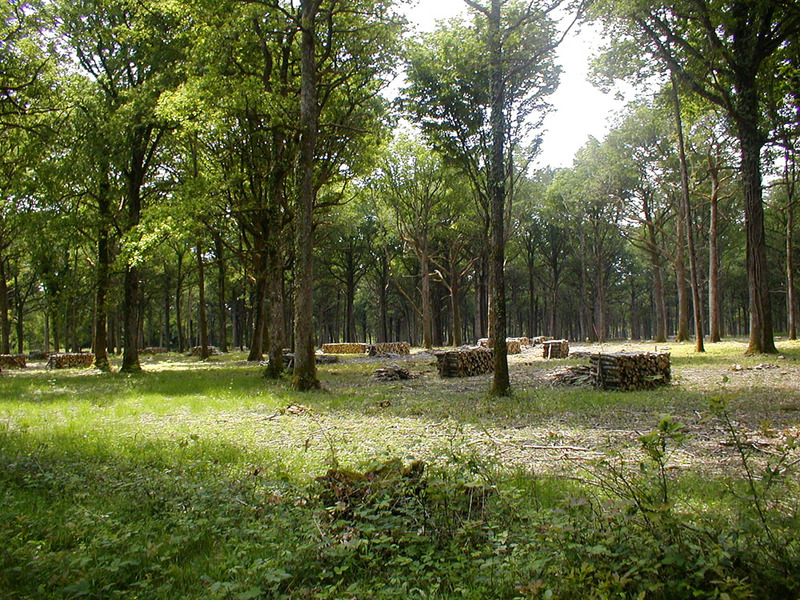 A parcel in the Forest of Preuilly managed for both lumber and firewood. The development of power plants using wood-chip (Saint-Pierre-des-Corps, Orleans that partially serves the Touraine, and soon Descartes) led some owners to develop coppice which allows a high rotation (the trees are cut every five years). Long term though it exhausts the soil because it consumes a lot of nitrogen. The president of the Private Foresters Union, Antoine Reille, believes that this production is not well managed and wood that is still wet is often being burned. Although he doesn't say so, I suspect that there is also a problem with much smaller diameter wood now having a commercial value and being removed, whereas before it would have been left to rot and replenish the soil. A parcel of young oak trees in the Forest of Preuilly. Reille is not ignoring the delicate balancing act required to ensure cash flow in the short, medium and long term. 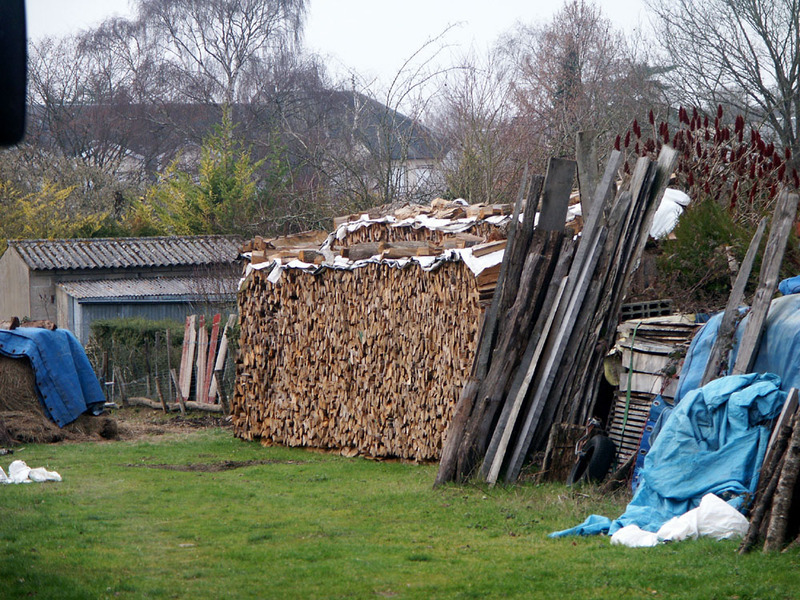 Coppice will make useable firewood in 25 years, a standard oak tree takes 80 years. But he feels that the market is only going to expand and there should be a sensible overarching management plan for the private forests. A walking trail in the section of the Preuilly Forest put aside for leisure activities. The Arbocentre Wood Energy Sector Manager is more optimistic. He acknowledges how tempting it is to seize the opportunity offered by bio-fuel. He believes the way forward is to set up a simple management plan and code of forestry practice. Included in this must be plots that are currently being stripped bare with no succession plan and profits must be reinvested in the forests of the future so there is no risk of deforestation. He also thinks the demand for bio-fuel will slow down. At the moment the three power plants consume 30 000 tonnes of wood and don't have much potential for increasing that. In addition any increase won't be at the sort of rate the foresters have experienced in the recent past. The market took off very rapidly but it's a recent phenomenon of only 5 years. The evolution will be slower. Source: La Nouvelle République article. I should point out that all the photos here were taken by us in the Forest of Preuilly, which is mostly managed by the very professional Office for National Forests and none of the issues discussed above apply. Also probably none of the wood shown above will be destined for wood chip, it will be to supply private households with wood burning stoves. There are private parcels in the forest though and I can't vouch for the management approach to all of them. 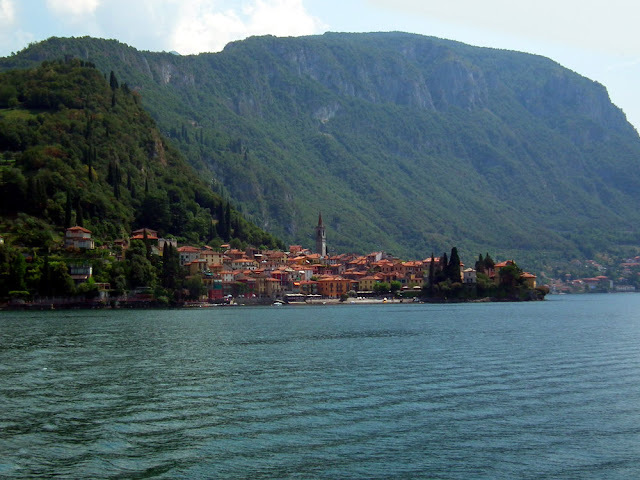 When we were in Milan a month ago we spent a day at Lake Como in the hope it would be cooler than the city (it was, but only marginally so). 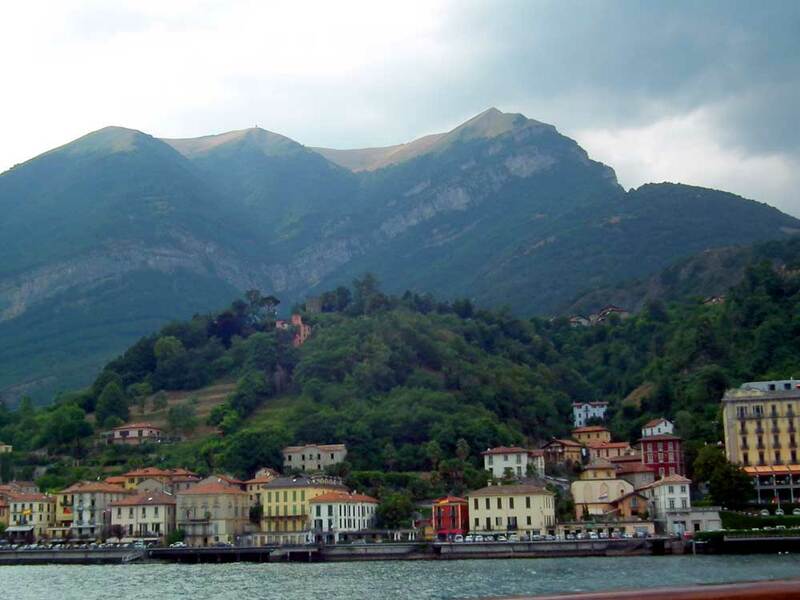 We bought a 22€ combined train/ferry ticket from Trenord and wandered up for an afternoon of sights - which is exactly what we got. The train up was swish, airconditioned and comfortable. 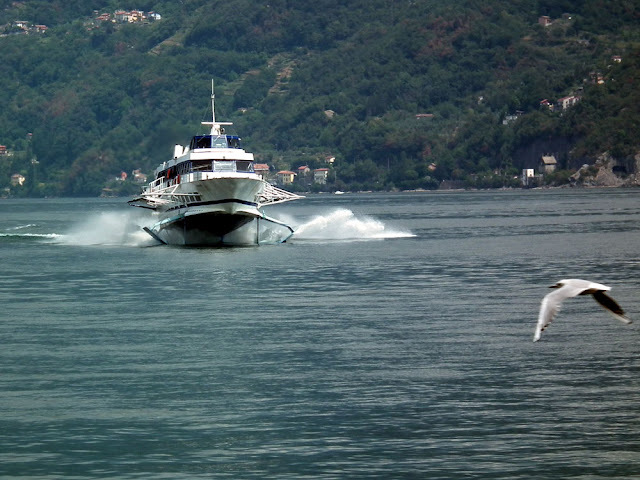 I really enjoyed our half day on the water, even if (as is usual) I had no idea what I was actually looking at. 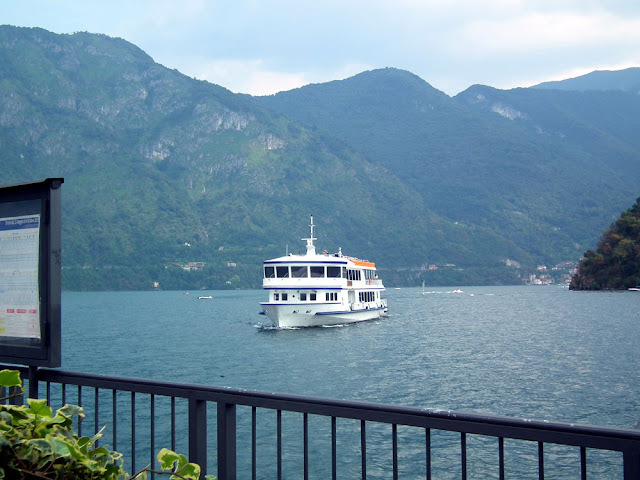 Even though it was crowded, it wasn't too crowded, one of my 3 gelati of the day was the best I have ever had (white chocolate/vanilla), and I had a day messing about on boats. Loire Valley Nature: An entry for Small Elephant Hawk Moth Deilephila porcellus has been added. This rather punk influenced moth is a good example to use if you want to illustrate the new research showing that tropical species are not more colourful than temperate. A la cuisine hier: Chicken thighs slow cooked with lots of spices, onion, homegrown shredded cabbage and slices of celeriac in beer (with a dash of tomato paste). The last of the pears are ripe and need using, so the big ones got the red wine glaze treatment, the little ones were quartered and poached in a heavy white wine syrup flavoured with cardamom. 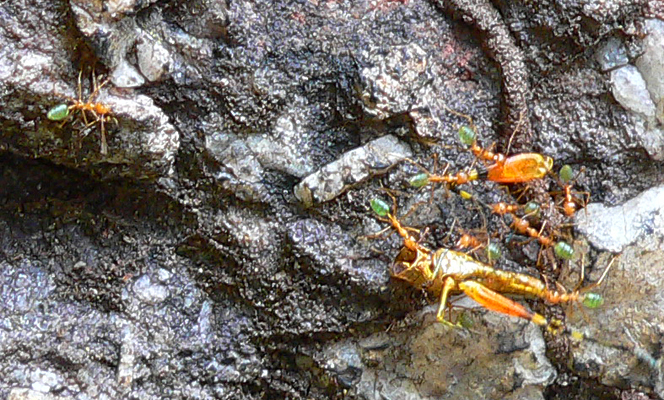 Green Tree Ants Oecophylla smaragdina dismember and cart off a grasshopper. These were photographed in Kakadu National Park, but if you live in tropical northern coastal Australia you are likely to have this species in your garden. Apparently they are quite keen on pet food. 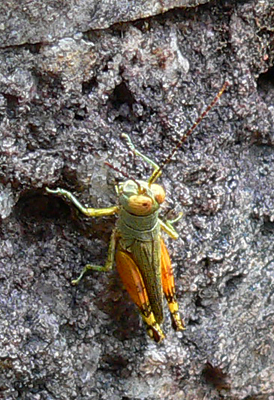 They can be useful pest controllers in the garden and commercial orchards. Joseph Banks described their remarkable co-operative behaviour when nest building when he observed them in action whilst the naturalist accompanying Captain Cook to Australia in 1768. They make nests in trees by bringing leaves together and sticking them together with a substance produced by the larvae. It's difficult to know what to make of Henri III. Physically he greatly resembled his father Henri II, being tall, dark and handsome. But in terms of behaviour he was utterly unlike any of the other Valois men of the Renaissance. They were all macho sporty types who loved hunting and jousting, even when their health wasn't good enough to safely participate. His grandfather, father and brothers, all kings before him, restlessly travelled the country, meeting their subjects and engaging with them both formally and informally. Henri III on the other hand was fastidious to the point of obsessive and hated encounters with hoi polloi. He loved jewels and luxury cloth but hated dining in public. He was so concerned with personal appearance he was considered effeminate, and he rarely went hunting. He disliked travelling so avoided royal progressions whenever possible. He liked to read and was an eloquent speaker. He was an elegant and skilled fencer and a capable military leader in his youth. 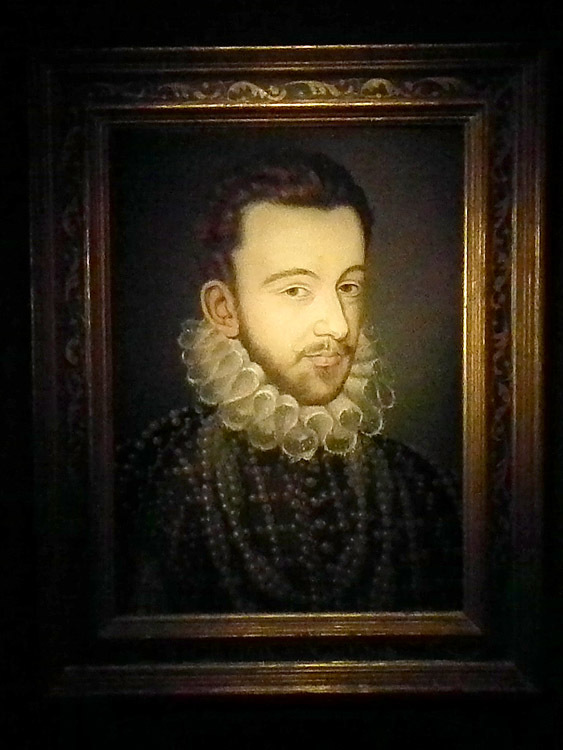 A particularly nice portrait of Henri as a young man, by François Clouet, hanging in Louise of Lorraine's 'bedroom' at the Chateau of Chenonceau. He doesn't seem to have cared much what other people thought. He was intelligent and educated, but eccentric and his personality led him to extreme behaviours which persisted for a while, then he moved on to the next thing. The opportunity for extreme religious fervour was always there in the late 16th century, and he was able to get carried away in typical fashion from time to time, with flagellations and ascetic retreats. At the time of acceding to the French throne he was unmarried, although already 24 years old. His subsequent choice of wife was very curious for the time. He could have married anyone in Europe but he had fallen head over heels in love with Marie de Clèves, a beautiful young Catholic woman married to a diehard Protestant, the Prince de Condé. He had hoped to obtain a divorce for Marie and marry her himself but she died before he could set it up. To console himself and because as king he needed a wife he chose to marry Louise de Vaudémont, who had grown up in the household of his sister Claude, the Duchess of Lorraine. She came with no dowry, more or less abandoned by her parents. But she was sweet tempered and physically resembled Marie de Clèves. She adored Henri and he fussed over her like she was a favoured child. He didn't want a wife who he could talk politics with -- he had his wily and experienced mother Catherine de Medici for that, and besides, politics bored him. 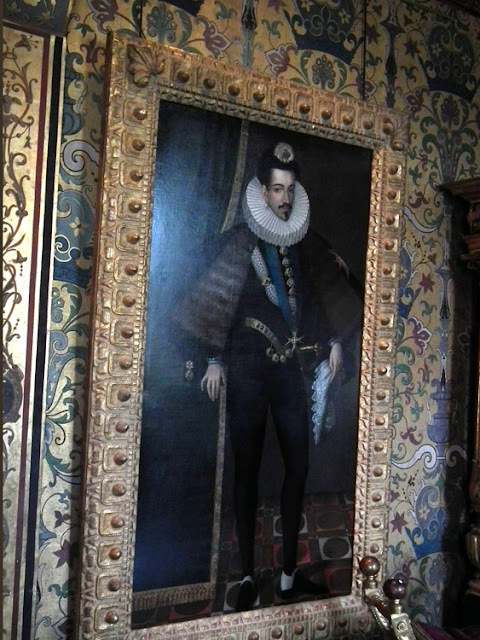 Portrait of Henri III hanging at the Chateau of Blois. 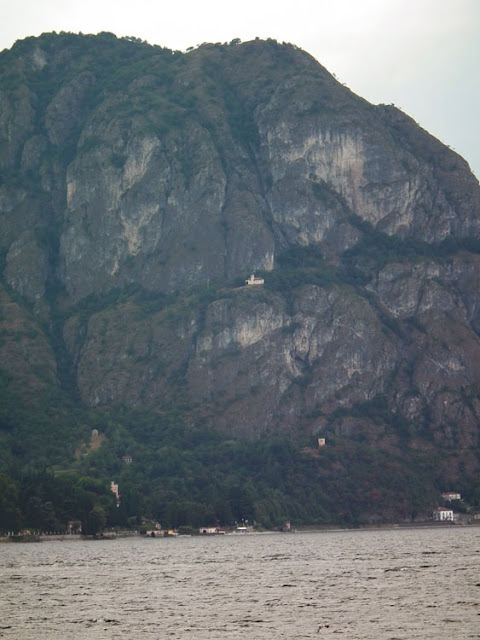 He surrounded himself with a group of young men who all aped his manners and dress. When any member of the group died he was distraught and unable to function for days. This behaviour led even at the time to stories that he was homosexual. Nowadays it is impossible to separate stories which were peddled to destroy his reputation for political reasons and stories which are true. He certainly had well known female lovers in his youth, but it seems to me that stories of his homosexual activities are contemporary attempts at scandalmongering and modern misreading of mores. In other words, the boundaries and sensibilities were different in those days. France in the 16th century was still to a large extent a warrior society. Soldiers (men) formed open and close bonds of comradeship. Henri, being the extreme personality that he seems to have been, simply expressed this bond in a more extreme way. The members of his circle of mignons as they were known were all from the second rank of the aristocracy. He could be top dog and they were glad to be part of the chosen few. swapped for a soft rolled collar, which he adopted when older. His eccentric and erratic behaviour destroyed his reputation. The general populace thought he was a laughing stock and the Protestants despised him. Both Henri de Navarre and Henri de Guise, leaders of the Protestant and the Catholic factions respectively were both more charismatic and more popular than he was. Finally he ended in the peculiar position of being a Catholic king having to ally himself with his Protestant opposition in order to try to contain the fanatical Catholics. 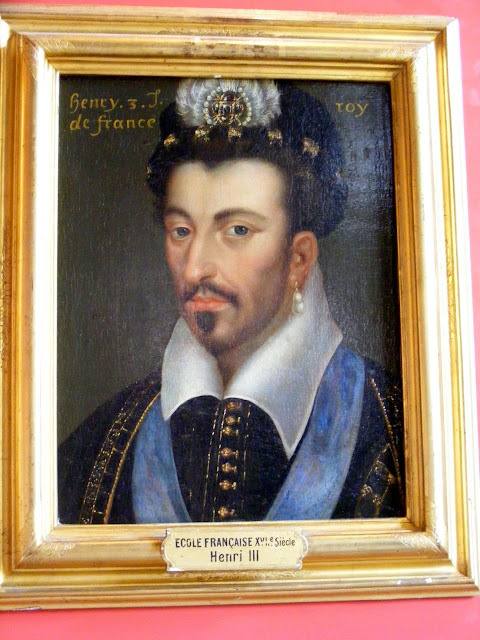 This led to a disasterous political decision on his part when he arranged to have Henri de Guise assassinated. 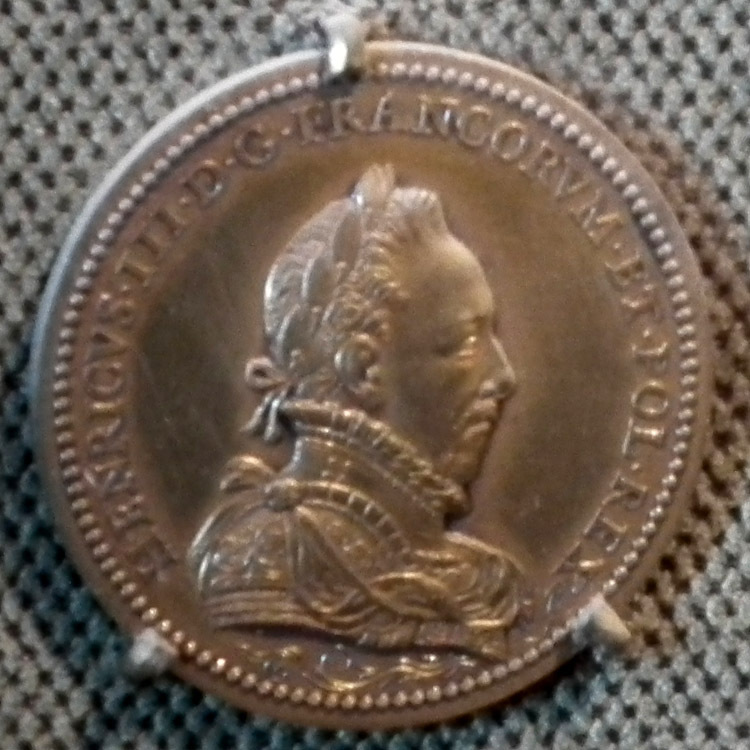 Portrait medallion of Henri III at the Chateau of Chenonceau. The end for the now rather pudgy Henri III came ignominously at the age of 37 whilst laying seige to his own rebellious capital. Seated on the toilet, wearing nothing but a loose robe that he had half thrown off, he signalled a monkish messenger to come forward and deliver his communication. The monk plunged a dagger straight into the king's guts. Henri pulled the weapon out thinking to defend himself, but made the wound worse. His guards hacked the monk to death and Henri was carried to his bed. He had time to write a reassuring note to Louise, who was at Chenonceau, but he died in the early hours of the morning. He was the last Valois king of France. In the beginning the most promising of Catherine de Medici and Henri II's sons, sadly he is remembered as a selfish and incompetant monarch, largely responsible for the chaos, intrigue and danger of his reign. This view of a complex and contradictory character naturally overshadows positive legacies such as his introduction of better sanitation systems and the table fork to France. Despite his eccentricities, some of his fastidiousness rubbed off permanently. For more portraits of Henri III see the wonderful blog Les Derniers Valois. Science News: Jean-Michel Drezen, of the François Rabelais University Tours, has just published a paper in PLOS Genetics. His research has revealed that parasitic wasps are involved in the horizontal transfer of genes to their lepidopteran prey via a virus vector. That is to say, the moths and butterflies are trans-genetically modified without human intervention. Not only that but the moths and butterflies have adopted the genes to protect themselves to some extent from another virus. Read an overview of the paper in Science. Remember I wrote about Bruce the Maremma recently? Well it seems that his fellow guardian dogs are being used in a thoroughly appealing and innovative way on an island nature reserve off the Victorian coast of Australia. Also, who wants to join the Fairy Penguin knitting project?! Irresistible, surely? UPDATE: Simon has found this blog post on the current requirements for penguin sweaters ie the original project was a response to an oil spill crisis, the current project is for fundraising and the sweaters go on toy penguins. Julie Andrieu is a French television presenter. 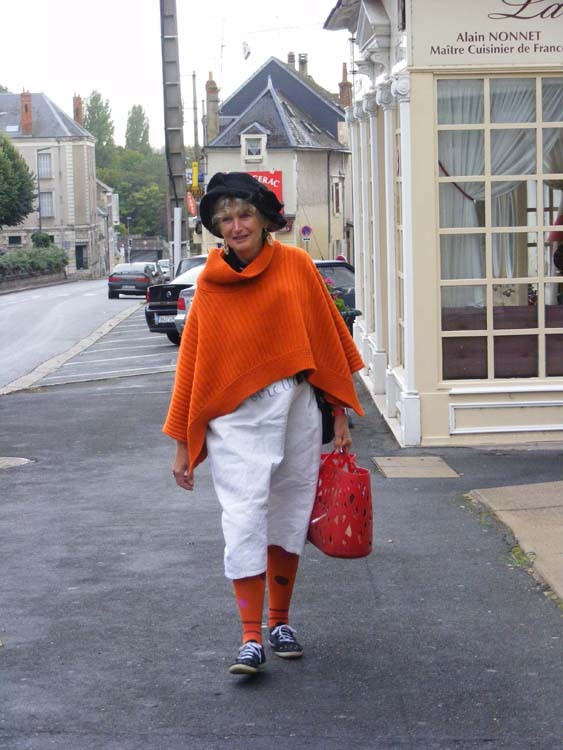 She makes a programme called Les Carnets de Julie (Julie's Notebooks) that we really like. 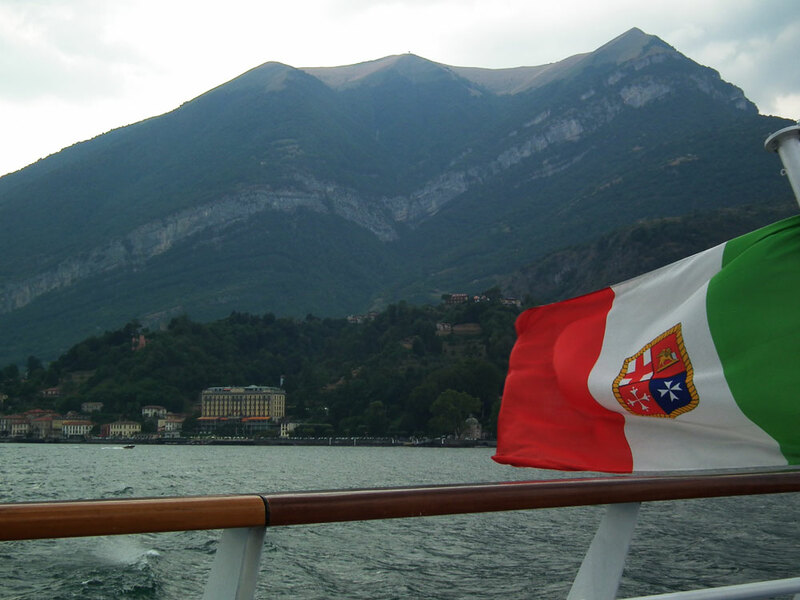 In each episode she concentrates on a particular area of France and interviews local cooks and farmers or artisans. They get a chance to show off their special product which is traditional and local usually. At the end everyone gets together for a meal. 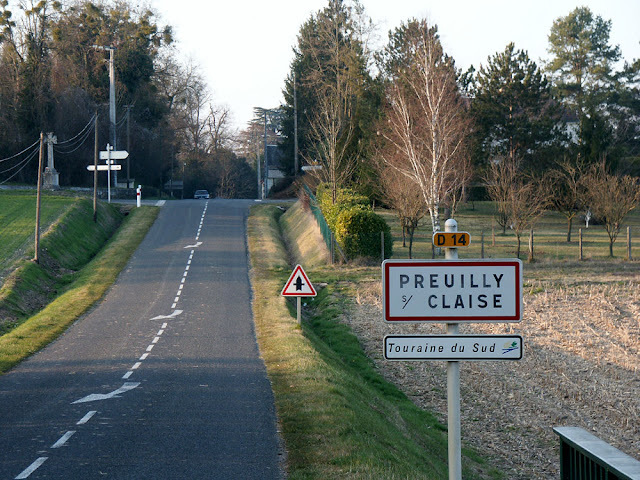 Just recently she returned to the Touraine and made a programme based in Chédigny. Our friend Fréd Sanchez appears at the end. He's the chef accompanying the poire tapée producer and he brings a dessert made from faisselle (smooth cottage cheese) and dried pears. He said it was a lot of fun participating. We are very jealous of Julie in this episode, as she gets to drive up to the front door of Chenonceau in her little red classic sports car. Julie has a natural and unaffected way of presenting that is rare on French TV. She has also clearly done her homework and really enjoys food. Her rapport with the interviewees appears genuine and the show is a great way for us to practice our French. Perhaps the thing we like best of all is that the participants are not an endless stream of the same old same old, but ordinary local people who have a passion for the food and drink of their region. The programme is an hour long in a magazine format. Half a dozen or so locals get to strut their stuff and it doesn't come across as superficial. For those of you who are now hooked, here is an earlier programme of Julie in the Touraine. Preuilly Market News: We are getting a new bakery in town. Laurence, a candidate for most beautiful and nicest baker in the world, has decided that she sells so much at the Preuilly market that she might as well open a shop. Her new premises will be at 21 rue de la Croix Blanche, just along from the médiatheque, and will open its doors to customers this Sunday. She is going to open Sundays, Tuesdays, Wednesdays and Thursdays, from 8 am (don't quote me on that -- I might have mis-remembered what she told me). Other good news is that the Organic Amazon is back. She works for les Jardins Vergers, the organic market garden and orchard just outside of town. She is going to be at Preuilly market with local organic fruit and vegetables on Thursdays for October and November. 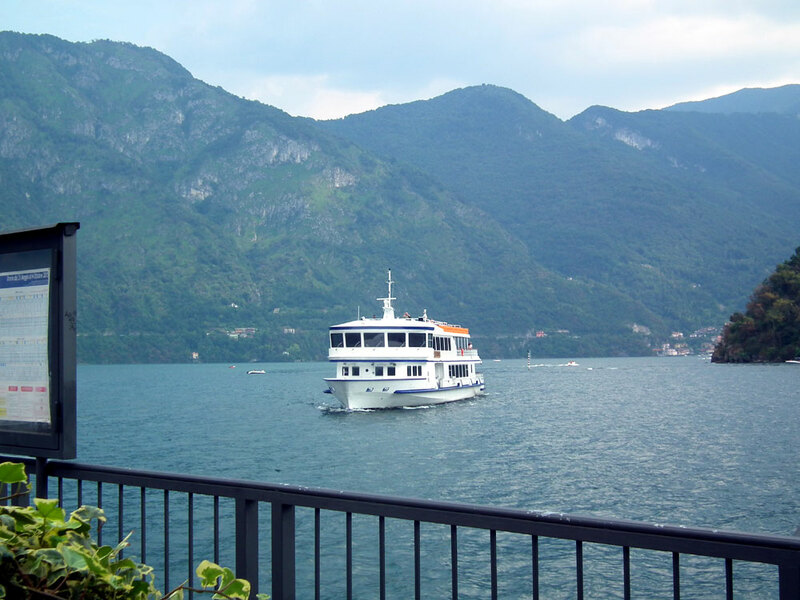 Then she's back off up into the mountains to work the winter season there. Au jardin hier: Some unwelcome creature has gnawed the top off my beautiful largest red cabbage. I must harvest all the cabbage I think and do a whopper batch of pickled cabbage. Since this is the first year I have succeeded in growing any sort of brassica I am mightly annoyed. The grapes have not suffered any further damage in the wet and wild weather, so I must now pick a dozen or so bunches every couple of days until we use them up. I took some over to T&P's yesterday. The Aged One has erected his walnut cordon, to prevent idle passers by from nicking his walnuts by stretching a rope barrier across the (public!) track. It prompted me to go and check our walnuts. I had assumed they would be a couple more weeks, but in fact several had dropped to the ground, so that's another thing that needs to be checked every few days for a while. I have two little Autumn Lady's Tresses Spiranthes spirales leaf rosettes appeared, but no flower spikes. On the whole that is good news. My one plant has multiplied into two, and they are not stressing themselves by flowering. A la cuisine hier: Apple and rhubarb flapjacks, made to Jean's niece's recipe. Anyone who has ever made flapjacks has no excuse if they still think of them as the healthy option. It is clear that the purpose of the rolled oats is not to provide healthy dietary fibre, but to act as a sponge for a considerable quantity of caramel. On my last supermarket shopping trip I was waylaid by the nice grazier from Aveyron who was there to promote his Label Rouge veal. After chatting with him for several minutes and admitting that I did know his product and when I bought veal that was what I chose I thought it would be churlish not to buy some this time. After a bit more discussion with him I chose a roast, something I have never cooked before. He stressed I must cook it hot and not too long, so it remained pink inside. I served it with a medley of roast veggies cut into 2cm dice and sprinkled with a spice and sea salt mixture given to us by Antoinette and Niall after their recent trip to Ile d'Oléron. Loire Valley Nature: A new entry for Redstarts Phoenicurus spp has been added. At this stage it is just a stub, but will get added to once I sort out more pictures. The Council of Preuilly sur Claise has voted by a large majority to welcome a number of refugee families to the town. They will be housed in six social housing flats owned by Val Touraine Habitat which are currently empty. It is assumed the refugees will be Syrian, Iraqi or Eritrean. 11 councillors voted for, 3 against and one submitted a blank voting slip in the secret ballot on Thursday evening. The block of flats the refugees will occupy is on the centre left. The mayor, Gilles Bertucelli, said he had to argue the case, and agree to a secret ballot, but got there in the end. Forty local inhabitants attended the open Council meeting, an unusually high number, but the issue is important. Some spoke at the meeting, some were just there to listen. One person was openly racist, but it was quickly obvious that they were outnumbered. As Monsieur Bertucelli said, 'Winter is coming. How can we leave these people who are fleeing a war to sleep outside when we have empty housing?' He is convinced that the businesses of Preuilly can only benefit. After checking with the headmistress of the school he is also reassured that the children will be able to join classes without difficulty. The flats, although modest looking on the exterior, are in good condition. There are two 5 room apartments and four 4 room apartments with garages. They have been empty for some months (more than a year for one of them). Monsieur Bertucelli says Val Touraine Habitat will be the landlord. The Council is going to use €1000 of State funds per family to help furnish the flats. An appeal has been launched amongst the local populace for furniture and crockery. Monsieur Bertucelli is going to donate the furniture from his parents' place (his parents are both dead now). The Red Cross will help too. He says that 'In this way, when they arrive, everything they need will be there'. It's difficult to say when the first refugees will arrive. The State has to finalise the deal with Val Touraine Habitat. Monsieur Bertucelli concludes that the mix of cultures can only be a positive thing. The state primary school in Preuilly. He is not the only local mobilising to help. Sophie Beau, whose parents retired to Preuilly four years ago, is one of the founders of SOS Méditerranée, a partner to Medicins du Monde who are well known for working with the refugees living in the infamous 'Jungle' camp near Calais. Their objective is to buy and outfit a boat in order to save refugees in peril on the Mediterranean. In a single week they crowd funded €163 095. To donate click on this link. 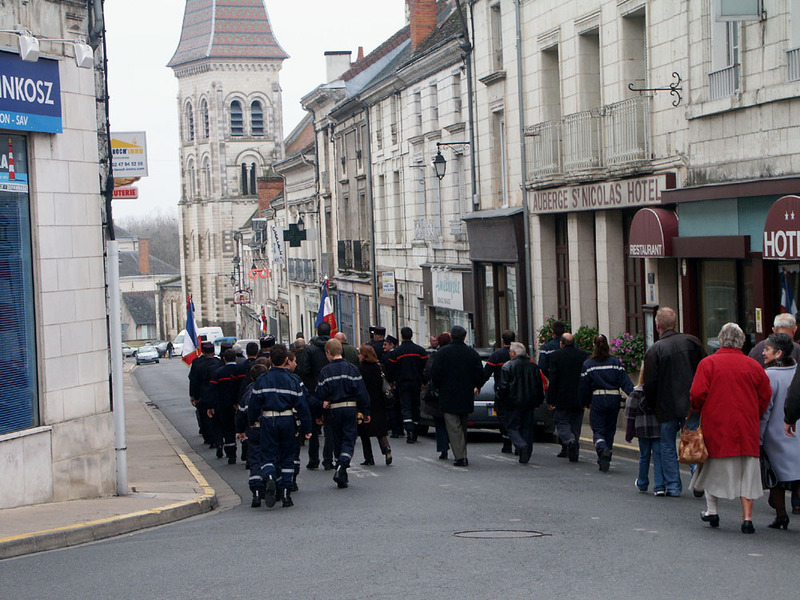 Preuilly's main street (on Remembrance Day). Sophie's parents Christiane and Bernard (who I recognise by sight, but don't know) have formed a committee to forge links between the residents of Preuilly and the refugees and help the refugees find their feet. Christiane herself, who grew up in Preuilly, is a retired French teacher who worked in a social centre in Paris in an area with a high immigrant population. She taught French to immigrants for 20 years, including volunteering after hours to teach women and children. She emphasises that it is necessary for them to learn the language in order to participate in daily life. Sources: La Nouvelle République articles here and here. The coopers Saury have bought a parcel of oak forest near Blois. This has been greeted positively by at least one local winemaker who has taken delivery of a 500 litre Loire Selection barrel. 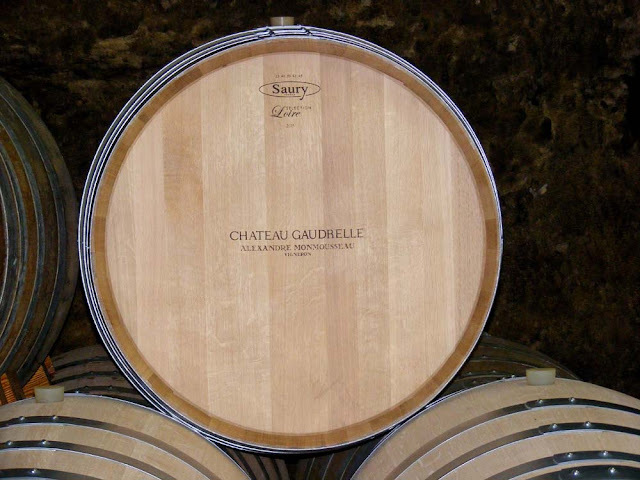 Chateau Gaudrelle make one wine which they mature in new oak barrels and every year they instruct either Saury or Vicard to produce a barrel to their particular requirements. 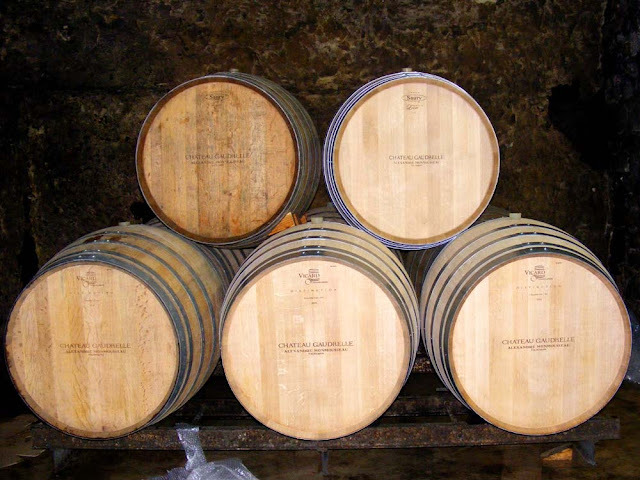 These barrels cost several hundred euros and are used for 5 years to make a dry white wine from late harvest Chenin Blanc grapes. They can't wait to see how Loire oak will influence the wine and look forward to this additional aspect of terroir that can be applied to the wine. The harvest started on Monday in Vouvray. Chateau Gaudrelle had expected to start a week ago but the appellation ruled that 21 September would be the earliest the winemakers could pick. Alexandre was worried that his grapes destined for sparkling wines were already at the upper limit of their sugar content and the later than expected start date would make producing sparkling difficult. Fortunately a lot of rain fell (45 mm overnight) and the grapes have plumped up with water, thus reducing their percentage sugar. Unfortunately a whole lot more rain fell several days later, an absolute deluge, and everyone started worrying about the chenin blanc grapes again. According to the local paper, the rain has put a dampener on the mood of the winemakers, who were happily expecting an exceptional harvest, but in fact the grapes haven't been much affected. Enough to lower everyone's hopes for the vintage though. Jim's Loire reported some rot developing at Montlouis, but it may depend on vineyard management practices. Loire Valley Nature: An entry for Thick-point Grimmia Schistidium crassipilum has been added. Although common in Britain this moss is rare in the Touraine. An entry for Roman Snail Helix pomatia has been added. 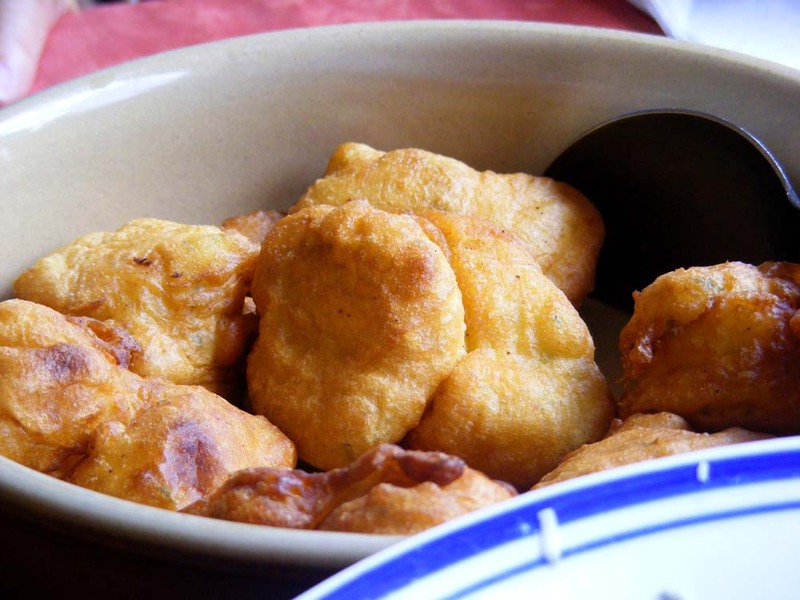 This local delicacy is now rare and protected. An entry for Ruddy Darter Sympetrum sanguineum has been added. This common dragonfly can be seen all over the Touraine. A photo has been added to the Red Helleborine Cephalanthera rubra entry. This rare orchid is one of the loveliest in the Touraine Loire Valley. This year for the Journées du Patrimoine (European Heritage Weekend) instead of visiting rarely opened historic buildings we decided to participate in some historic recreation. 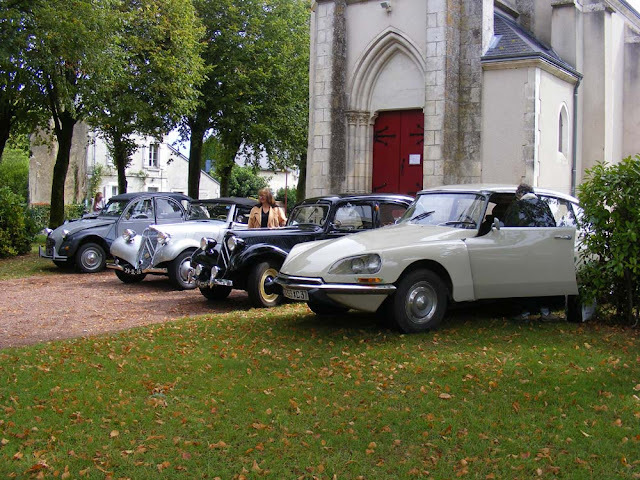 Along with friends Colin and Elizabeth and Tim and Pauline we registered ourselves and our classic Citroëns for the Heritage Traffic Jam at Sainte Maure de Touraine. (no he is not the one dressed as a nun). 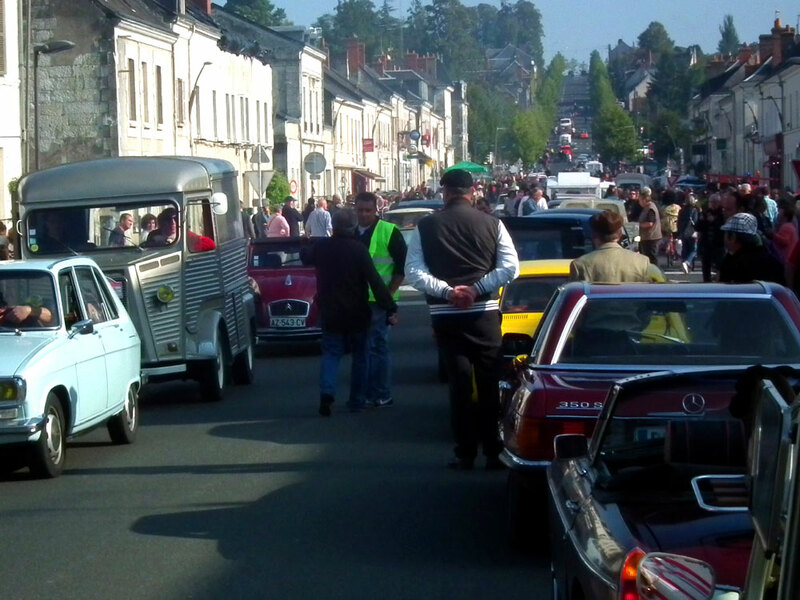 This was open to anyone with a car older than 1974 and our friend Fabien was one of the organisers. Participants were asked to accessorise their cars and themselves so that the event recreated the look of a weekend in August before the town bypass opened. In the 70s and earlier the N10 (national highway 10) went straight through the middle of town. Everyone heading south from Paris for their summer holiday (or north on the return journey) passed through. Tim, probably saying merde quite forcefully. This regularly led to gridlock, with cars overheating and breaking down. It's long enough ago now though that people who remember going on holidays like this as kids look back with nostalgia not horror. Thus, a movement has been born to recreate the holiday scrum. Not one of the cars you can see in this picture is less than 40 years old. It certainly brings out a wide variety of cars and a good deal of the French delight in dressing up and play acting. Policemen, postmen, cyclists, stressed out couples, hippies and hicks all featured and entertained the amazingly large crowd who gathered to photograph and enjoy the spectacle. 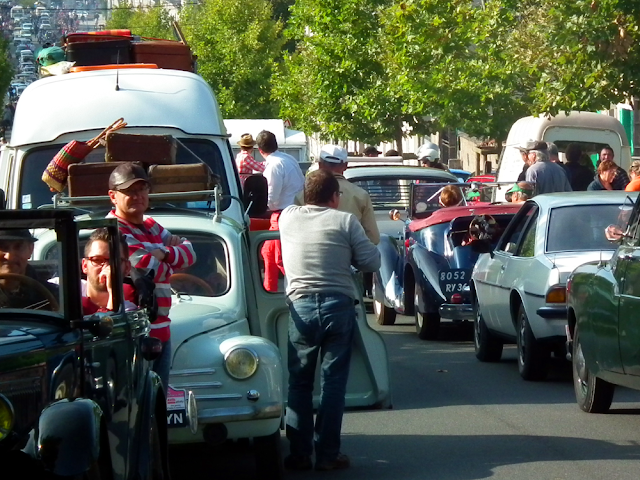 Some of the 300 classic cars in the centre of Sainte Maure de Touraine. Now there is a bypass the centre of Ste Maure can be closed off to regular traffic, allowing the classics to stop-start their way up and down the old N10 in the centre of town. Some vehicles had more difficulty than others negotiating the new fangled roundabouts, so progress was rarely smooth. That was fine. It all added to the authenticity, and if there was a blockage, everyone just stopped and got out of their cars -- just like the old days. We chatted with passers by, both strangers and acquaintances. We took gazillions of photos and some movies. Half way round the first circuit Tim applied his handbrake a little too vigorously and the handle came off in his hand. Fortunately he had some chocks for the wheels and pulled over to the side to bodge a temporary fix. By the time we got round to him again he'd tied the handbrake cable to a rope and attached it to the windscreen wiper knob or something. 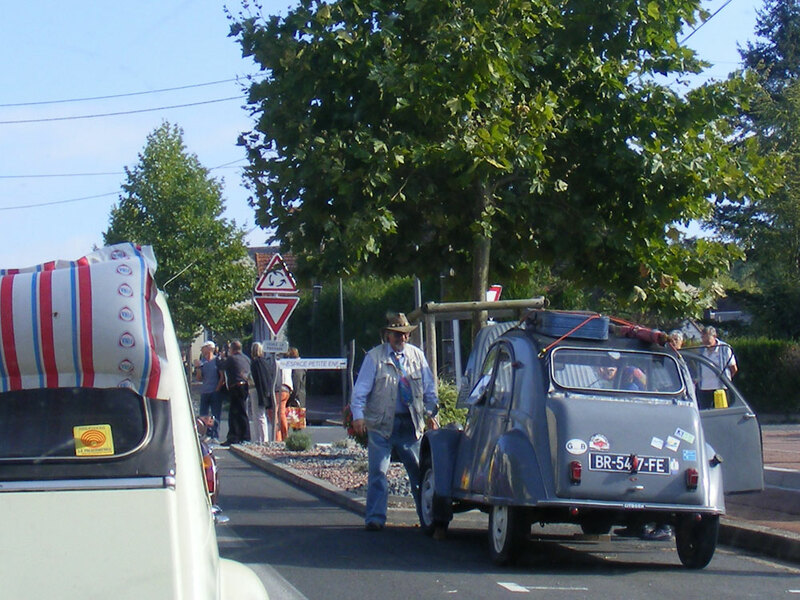 At any rate, he and Pauline and their 2CV rejoined us and we went off to have a picnic lunch at the local campsite. After lunch we strolled through the camp, where the really keen retro enthusiasts had set up their period caravans and tents and spent the night. Then we bid farewell to Colin and Elizabeth and followed Tim and Pauline home just to make sure nothing else fell off their car and they got back safely. 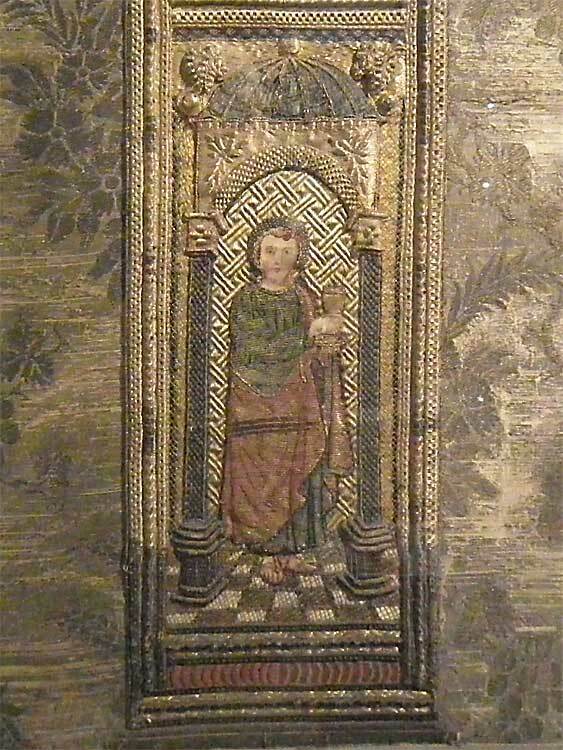 This embroidery (detail above, full piece below) is tucked away in a dark corner of the museum section of the Basilica di Sant'Ambrogio church in Milan. Neither Simon nor I photographed the label beside it so I can't tell you anything for sure about it. Even if I had the label information that would amount to a date and country of origin and no more. There is absolutely no information about this object on the internet that we can find (nor can Antoinette with her medievalist links). So here is what I think: It is one of the most outstanding example of Gothic applied couched metal and filament silk thread work that I have ever seen, at least from a technical skill point of view. It dates from a period between 1400 and 1550, when the Italians were producing magnificent silk cloth and professional embroiders were employed to ornament it with bands or motifs stitched on linen and then applied like patches on lengths of fine silk cloth. It appears to be an altar cloth, featuring a number of saints in a stylised architectural setting. The detail is so fine that at first I thought the faces were painted. They are not. They are worked in the tiniest stitches in the finest silk. Who were the embroiderers? Difficult to say. They may have been Italian, but they might have been English, or even Flemish. They were probably women, but not necessarily. They might have been nuns, but more likely lay professional embroiderers. I get the impression that whilst this piece is valued enough to be kept in the museum and displayed, there is so much gold in one form or another in Sant'Ambrogio that this embroidery is outshone in most people's minds by gold mosaics from the 5th and 13th centuries and the even more extra-ordinary 9th century golden altar (blog posts about the rest of Sant'Ambrogio's treasures to come...). Banded Fruit Dove Ptilinopus cinctus. 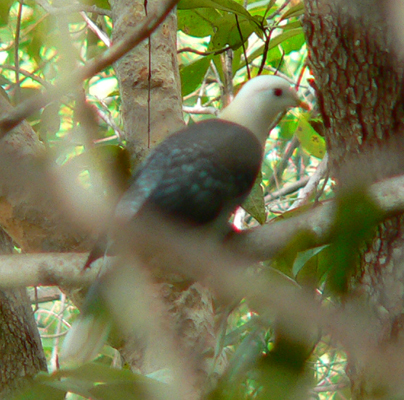 The Banded Fruit Dove is a black and white pigeon that lives in the monsoon forest of the western edge of Arnhem Land. It is found nowhere else in Australia although it also occurs on the island of Bali. This one was photographed at Nourlangie. They eat wild figs. This pair were photographed on their nest on Yellow Waters. They occur all across northern Australia and I used to see them occasionally in the area where I grew up. Unlike European storks these birds do not form flocks. They are solitary or pairs. 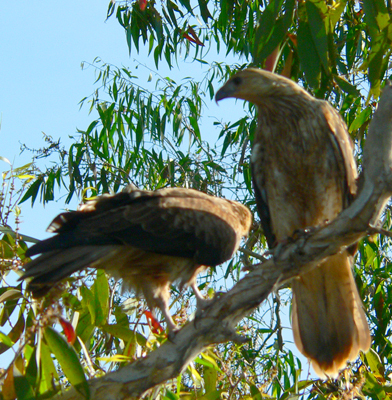 Whistling Kites were always present where I lived in Australia. Their distinctive call is one of the sounds of the Australian landscape. They are birds of open woodland, often found near water. 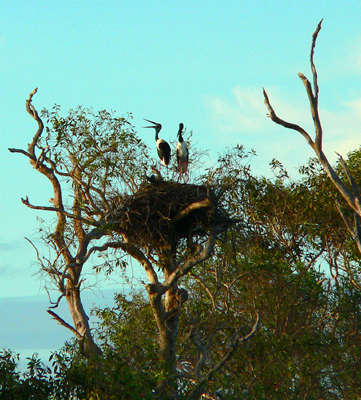 This pair were photographed from a boat on the South Alligator River. Maria de' Medici was born in Florence in 1575, the daughter of the Duke of Tuscany and his Habsburg wife. Although she was their sixth child of seven, only she and one much older sister survived into adulthood. She was not particularly closely related to Catherine de' Medici, but from a branch of the family not descended from Lorenzo the Magnificent. Portraits of her show that luckily for her she didn't inherit the Habsburg jaw and she seems to have been a pretty young woman. Unfortunately she also seems to have grown up into a rather stupid and greedy woman. When she was 25 years old her father received an offer for her hand from the French King Henri IV. This was an entirely pragmatic move on Henri's part. He was heavily in debt to the Medici family but wanted to fund another war. Maria's dowry would solve that problem. In addition he had divorced his first wife Marguerite de Valois and had no legitimate children. He needed an heir, and 11 months after their wedding Maria produced the goods on this front as well. painted by Charles Martin in 1603 and hanging in the Chateau of Blois. Henri spent his marriage trying to keep the peace between his Queen and his mistresses. He had promised to marry his principal mistress, and Marie's appearance on the scene lead to most unedifying rows. Curiously, Marie seems to have had no quarrel with her predecessor Marguerite, and supported her return to court from exile in the French mountains. Once back in Paris Marguerite was closely involved with the raising of Henri and Marie's growing brood. Henri was assassinated before his heir Louis was yet 10 years old, which meant that Marie, as she is known in France, became regent. Unfortunately Marie was completely under the malign influence of her maid and her maid's husband. They set about feathering their nest and Marie, as a Catholic and a Habsburg, started reversing all of Henri's foreign policy aimed at keeping Spain at bay. The capable Duc de Sully was dismissed as Foreign Minister. Their oldest daughter was betrothed to the heir to the Spanish throne. Finally the senior nobles of the court got fed up enough to revolt, and the next year the young king asserted his independence. He exiled his mother to the Chateau of Blois and had her maid and her husband killed. 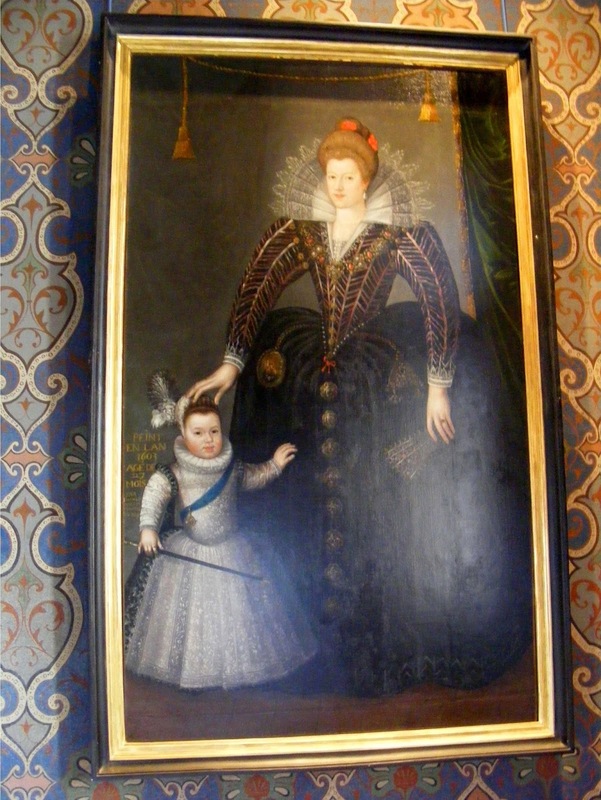 Marie managed to escape from Blois after two years and with her younger son Gaston d'Orléans she tried to take the throne. After her rebellion was defeated, Richelieu (at this stage her protegé) negotiated with the King to let her set up a small court at Angers. Over time the King began to rely more and more on Richelieu for advice and they both distanced themselves from the Duc d'Orléans and the Queen Mother. Marie intrigued long and hard to engineer Richelieu's fall from grace, but failed and in 1631 went into exile and never came back to France. She tried visiting her youngest daughter, Henrietta Maria, the wife of Charles I of England, but as a Catholic in a Protestant country it wasn't very comfortable. Eventually she ended up in Cologne in Germany, where she died in 1642 in much reduced circumstances, having schemed against Richelieu and Louis XIII until the end. 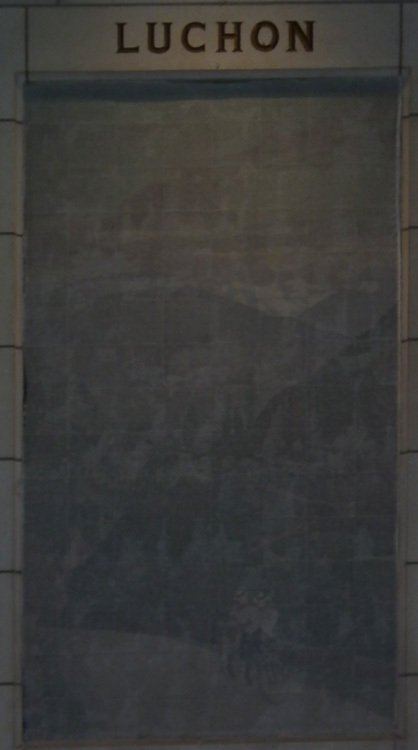 Another of the panels in Tours station - and this one looks like it needs some serious work. Luchon (actually the name is Bagnères-de-Luchon) is right in the middle of the Pyrenees: trains no longer go there, because of the poor state of the line which was closed in 2014. 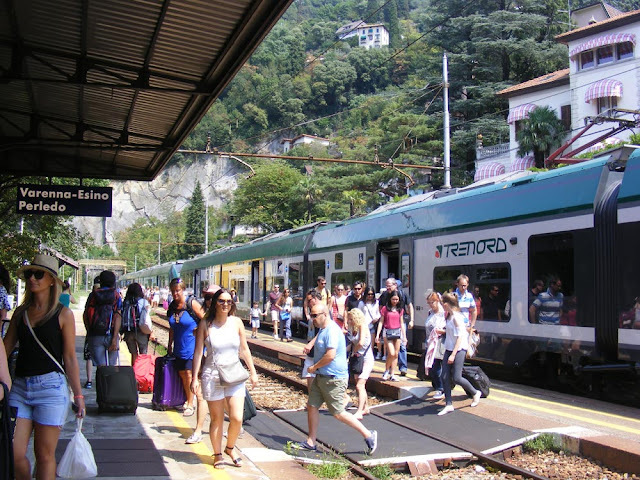 Instead, if you wish to travel by public transport to Luchon you need to finish your journey on a bus from Montrejeau-Gourdan-Polignan. The start of the journey is no more "trainy" either: from Tours you catch the bus to Chateauroux. 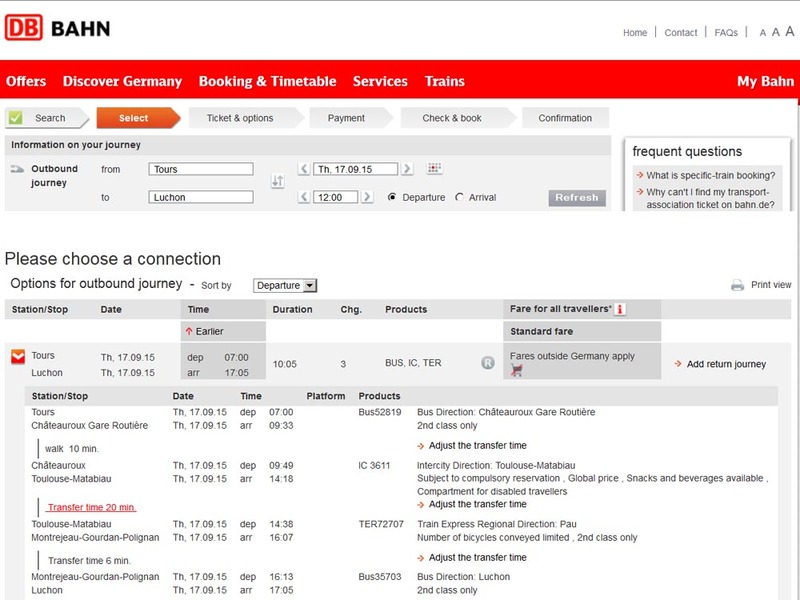 There is a quicker way of travelling completely by train to Montrejeau-Gourdan-Polignan (via Bordeaux and Toulouse) but it does involve more changes. Changes are stressful, so they are best avoided. Luchon looks interesting: it is one of the obligatory stages of the Tour de France, and has been since the race started. Xynthia, the storm we had at the end of February 2010, blew at 200 km/h on the peaks above the town, and there are some serious mountains all around. One for the list, methinks. Saving Salamanders: Many of our readers will have heard of the devastating fungal disease that is killing frogs worldwide. Sadly a similar disease has emerged recently that affects salamanders. Jonathan Kolby is co-ordinating a citizen science project to get some idea of the spread and incidence of the disease. If you see a dead or sick salamander please photograph it and record it on his website. You don't have to be able to identify the salamander to species level, you don't have to be a great photographer, but he will be deeply grateful to you for making the effort to send him the details of your find. Here in the heartland of the Salamander King himself, I think we owe it to the memory of François I to get involved. 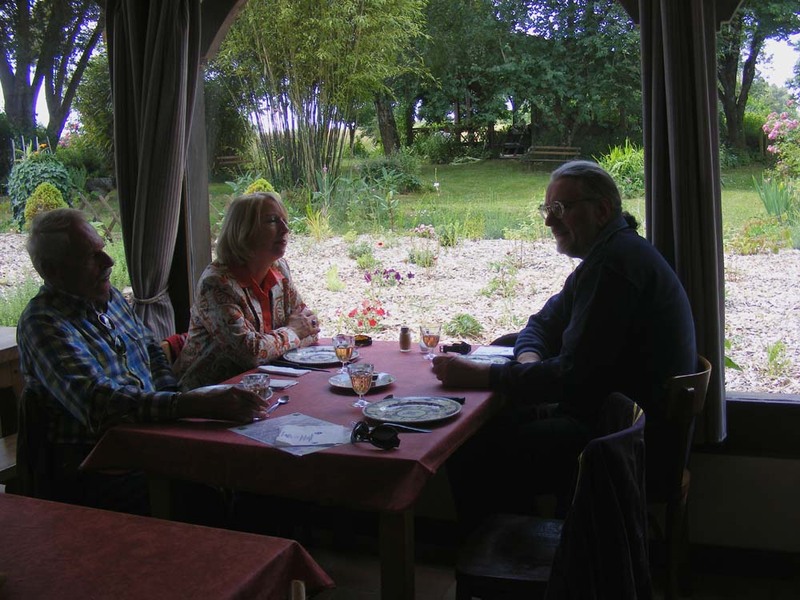 Back in June we had lunch at the Ferme Auberge de la Lionnière near Mareuil sur Cher. It was delicious and we had a great time. The simply furnished restaurant with its big windows overlooking the back garden. A ferme-auberge is a farm with a restaurant. The meals must be made from 75% produce that comes directly from the farm itself. When I rang Françoise Bouland, the owner and cook, to reserve a table she couldn't tell me what would be on the menu, or even exactly what the price would be. She serves a daily changing menu of a starter or two, a main, cheese and a dessert, with local wine. The price varies depending on what the meat of the day is, but is generally around €25 per head. La Lionnière is a goat cheese farm and they raise some poultry and lamb, therefore the meat is always goat, lamb or poultry of some sort. When we got there she asked us if we would like goat cheese beignets (deep fried dumplings). She said it was only worth making them if we all wanted them and it would mean waiting a bit. We said yes and boy are we glad we did! We all absolutely loved them. They are not for those with limited appetite though. 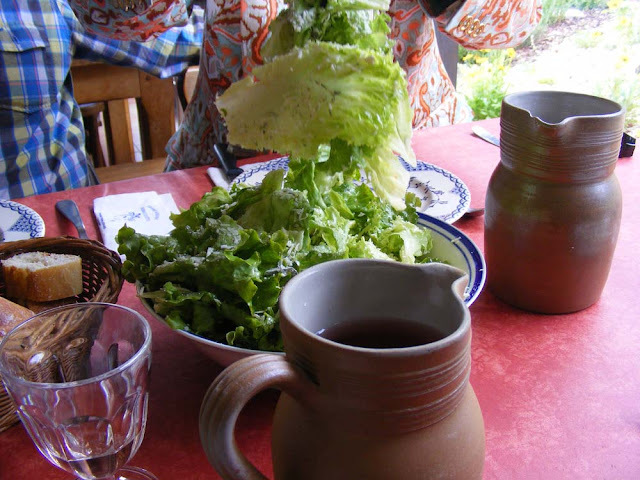 Crisp green salad, wine and water in traditional salt glazed jugs. Before the beignets appeared we were given a green salad dressed with finely grated aged goat cheese. Also delicious, and worth trying at home. This salad reappeared after the main course, to accompany the cheese course. The main course was guinea fowl, cooked in a rich and savoury wine sauce and accompanied by fried potatoes. Françoise apologised for the lack of vegetables. The garden had not been performing well and it was too early for green beans. I commented that I had a good crop of broad beans at the time and she said she didn't serve them in the restaurant because so many people don't like them. We agreed that clearly most people are crazy. By the time we had eaten the guinea fowl we were stuffed to the gunwales, but it was all too delicious not to scoff everything she put in front of us. 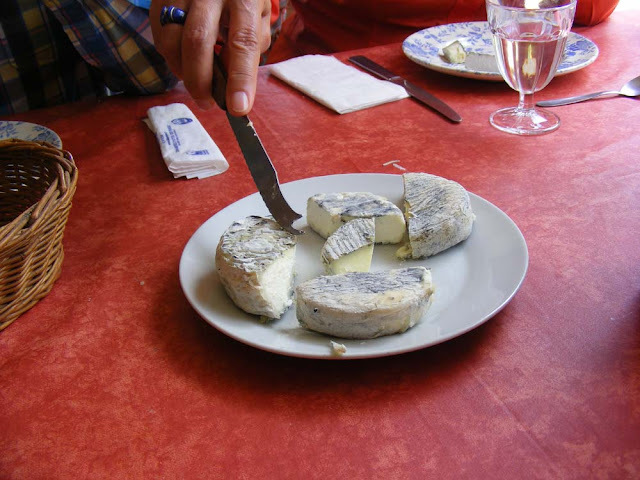 The cheese was three disks of their Selles sur Cher style goats cheese, of different ages. To be honest, I've forgotten what the dessert was, but I know it too was delicious. Being June it was probably something with cherries. The farm is surrounded by vineyards, so the wine we drank was extremely local. Françoise grew up in Saint Georges sur Cher, a town full of winemakers on the other side of the river just down the road. When we mentioned the winemaker we were visiting there after lunch Françoise said to say bonjour. She had gone to school with his father. we managed to make quite a dent in the cheese. The goats at La Lionnière live an outdoor life. Françoise is adamant that cheese made from indoor goats is a pale imitation of the real thing. She also told us that they are winding down the goat herd and the cheesemaking. This will be the last year they make cheese and she and her husband are planning to semi-retire. They will continue to run the holiday accommodation and the restaurant, but the cheese served there will come from a cousin who lives near Preuilly sur Claise. 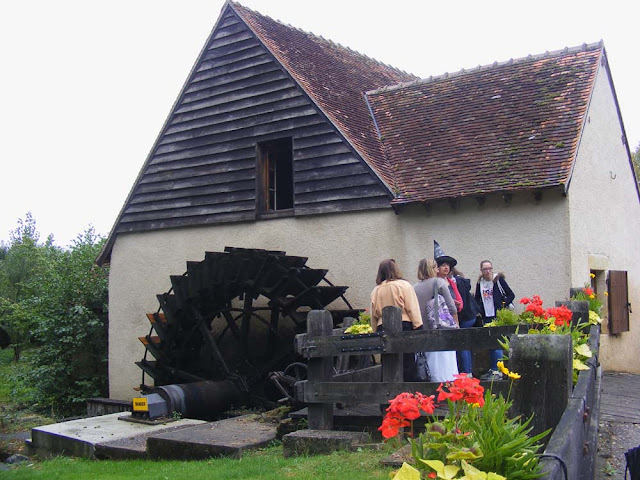 We would highly recommend the ferme-auberge as a friendly place to eat simple traditional French food. Booking by telephone is essential (and I don't think they speak English, or respond to email). They don't take bank cards, only French cheques or cash. Loire Valley Nature: A new entry for Marbled Fritillary Brenthis daphne has been added. This is one of my favourite butterflies and it is currently thriving in France. Heritage at Risk: If you are planning to visit somewhere that is open this weekend 19-20 September for the Journées du Patrimoine please consider choosing one of the sites featured by Urgences Patrimoine or Patrim'Action. This year in the Touraine the focus is on l'Etoile Bleue, currently the home of the Jeune Chambre Economique de Tours (Young Entrepreneurs Association of Tours). The building is a former brothel decorated inside with murals and mosaics in the Art Deco style of 1925. The most notable of these is a series depicting a naked woman frolicking with a number of greyhounds (ahem...not exactly to modern tastes, but important local heritage nonetheless). The wall paintings of l'Etoile Bleue are suffering from damp and although some conservation work has been undertaken, funds have now run out. Patrim'Action will be selling Tickets-Patrimoine to raise money for the project. Essentially these are a donation, but there will be a prize draw and the winner will receive a special private evening guided tour for themselves and three guests once the work is complete. Members of Urgences Patrimoine, including the wall paintings conservators who worked on it, will be there on the weekend to talk about the building and its historic value. Urgences Patrimoine highlights buildings at risk all over France, Patrim'Action is a new association whose motto translates as 'Don't just look! Do something!' Some pictures of l'Etoile Bleue can be seen on the wall paintings conservator Sabine de Freitas' blog l'Atelier du Passé Présent. By visiting the sites they highlight you are supporting their work to make these places more known and appreciated, the first step to saving them for the future. A la cuisine hier: Two Tartes Tatin, one for now, one for the freezer. To be perfectly honest I'm not a huge fan of tarte tatin, but Simon likes it and requested it. It is a very easy dessert, requiring no finesse whatsoever except in the matter of turning it out (a step which you can skip if it's just you and you don't need to impress anyone...). And it used up a couple of kilos of apples, which in this apple abundant time is a good thing. Also it is a traditional local dessert, the Sologne equivalent of Bakewell Pudding, supposedly invented by accident in the 19th century. 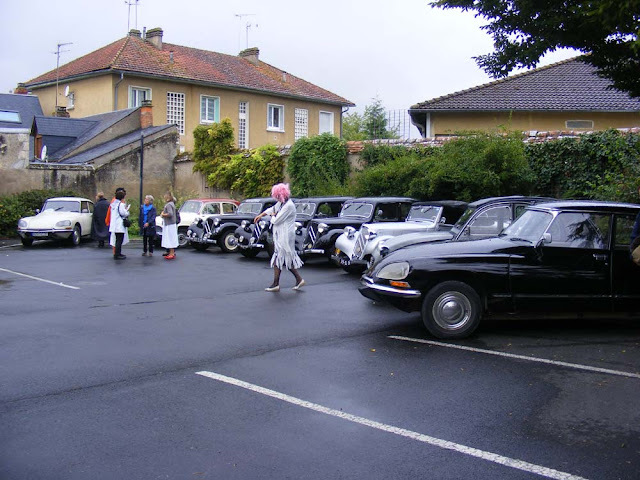 On Sunday 13 September it was the 10th annual Birettes outing of the classic car club that we belong to. Our club, the Centre chapter of La Traction Universelle, maintains close ties to CitroBerry. 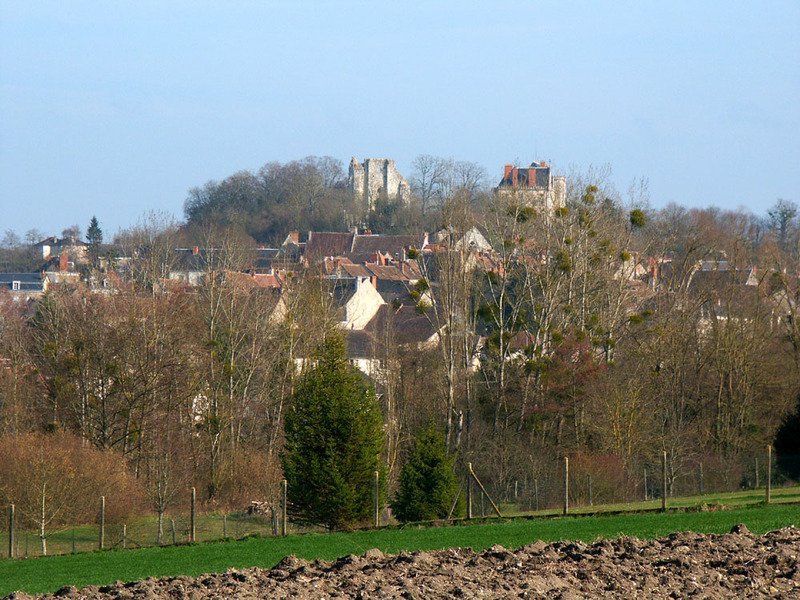 Many of our members live in Berry, the name of the old province based around Bourges. Birette is a Berrichon dialect word meaning 'witch'. Thus, the Birettes outing is a women only affair. 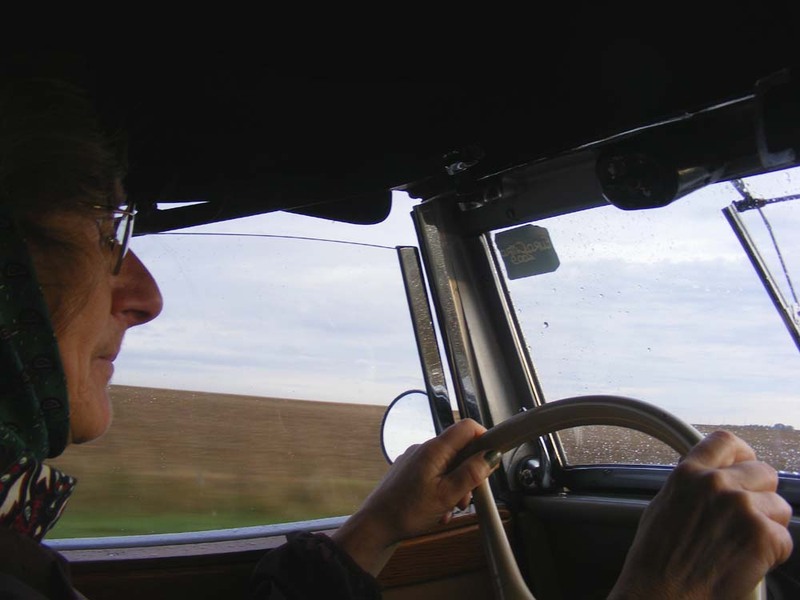 Suzanne driving between Chateauroux and Issoudun. I arranged to go as passenger-navigator with my friend Suzanne, the wife of our mechanic. This involved me driving through the forest and the Brenne for an hour at deer-crossing o'clock to get to her place by 8.30 am. Bernadette arriving for breakfast in Issoudun. 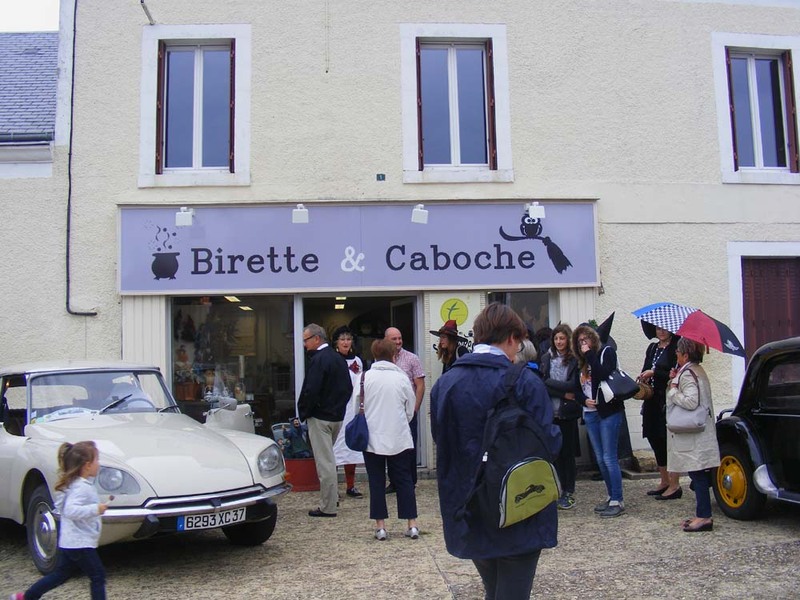 We had opted to go in the cabriolet, but it was a grey gloomy day and we didn't even make it out of Chateauroux before it started to rain hard enough that we had to stop to put the top up. Then it was out along the deeply dull road to Issoudun, straight through a flat plain of endless cereal growing farms, enlivened only by the futuristic Radio France antennae array. 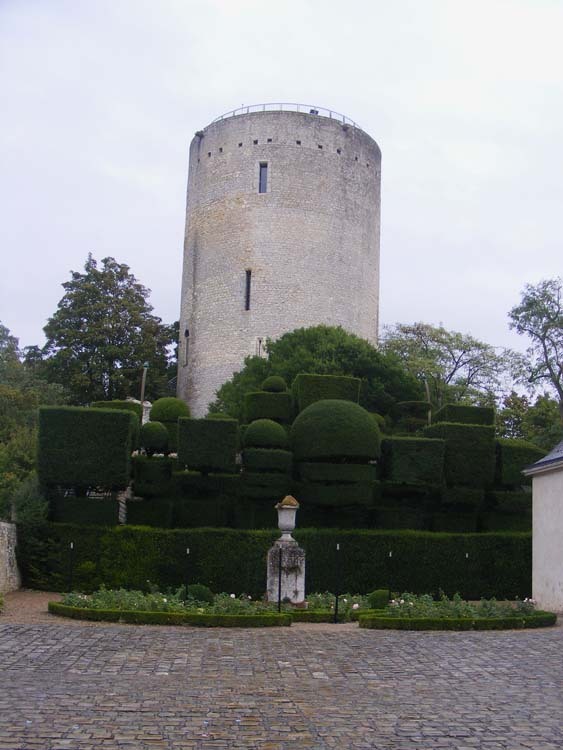 La Tour Blanche ('the White Tower') in Issoudun. The Birettes were told to meet at a certain café in Issoudun at 9.30 am, where breakfast would be served. 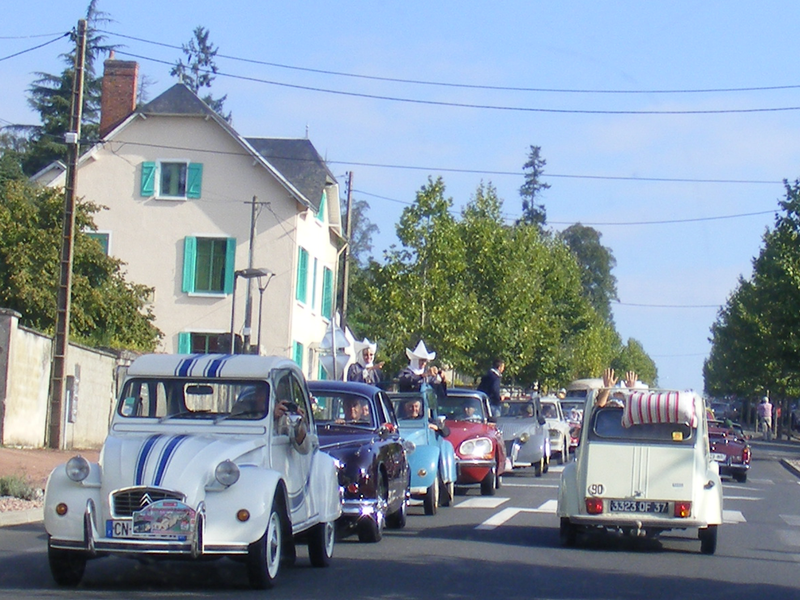 A total of 7 Citroëns and a Simca turned up, with about 20 women aged between 16 and 60, dressed in varying levels of eccentric costume. A post breakfast walk around the old centre of Issoudun got as many comments about the costumes as it did about the cars. Suzanne had lived in Issoudun when she was first married and her oldest son was born there, so it was quite nostalgic for her. and white jacket is a reporter from the Nouvelle République (local newspaper). 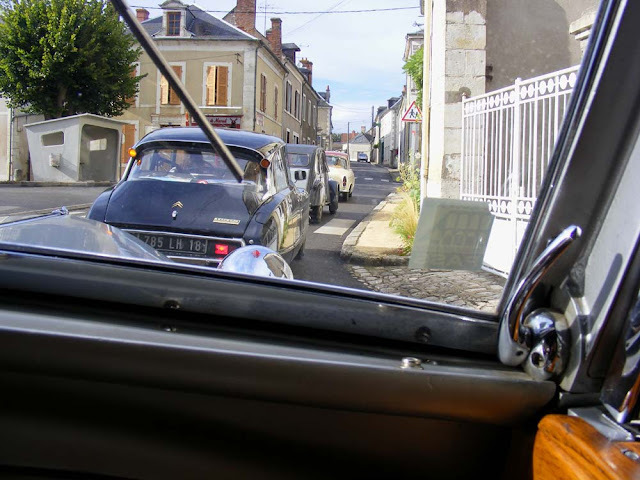 Then we got in the cars and snaked our way through the narrow streets to the Musée de l'Hospice de Saint Roch. 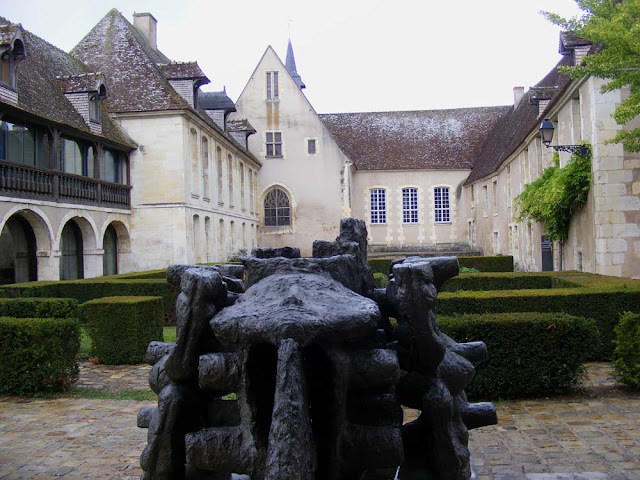 Issoudun is on the pilgrim route and the museum is the old pilgrim hospital building on one side and a modern purpose built gallery on the other. Let me tell you the whole museum is absolutely outstanding! It's free and has the most amazing collection, all of objects with a local connection. They include grave goods from a 5th century BC burial, the 15th century chapel of the hospital with a pair of high relief carved Jesse trees, a 17th century apothecary, a 19th century pharmacy, Micronesian artefacts collected by two local artists and benefactors, prints and drawings and modern sculpture. The Hospice de Saint Roch. Next stop was a picnic lunch in a nearby village. Fortunately Bénédicte had organised a room so we could eat without fear of showers. I had taken smoked fish and cream cheese paste, spread on Turkish flatbreads, rolled and cut into logs. They were a great hit. I also ate rice salad, a homegrown apple and some chocolate fudge cake all provided by others. Parked in front of the church near where we had lunch. The new specialist tea shop in Montipouret. After a while the word spread that the mayor was waiting for us at our next destination, the Moulin d'Angibault. This 18th century mill provides the setting, and title, for one of George Sand's novels and is now owned by the local authority who run it as a heritage attraction. She was very much from around these parts and I was interested to note how much Suzanne and Bernadette knew about her and how much they loved her writing for its evocative descriptions of their countryside. Once we'd escaped from the mayor's clutches we tootled off northwards again to meet up with assorted spouses, who had organised their own outing to a wind farm. 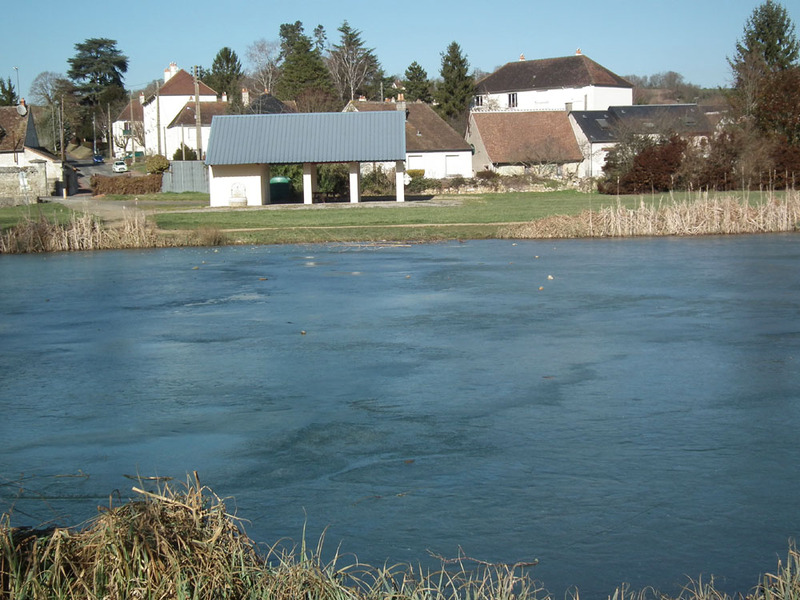 A joint apératif was held on the shore of the lake in Mareuil sur Arnon and then we all made our way home. At the main intersection in Mareuil sur Arnon. 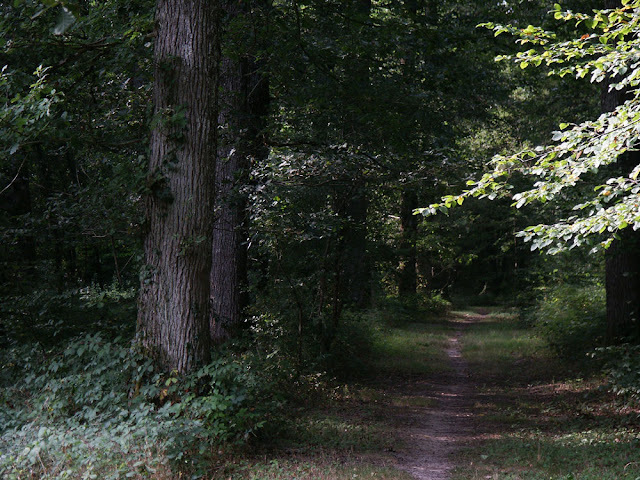 I got home at about 9 pm, having crossed back through the Brenne and the forest, in the rain and increasing darkness, not having spotted a deer the whole day. Update: Here is a link to the newspaper article: Sortie remarquée des Birettes.